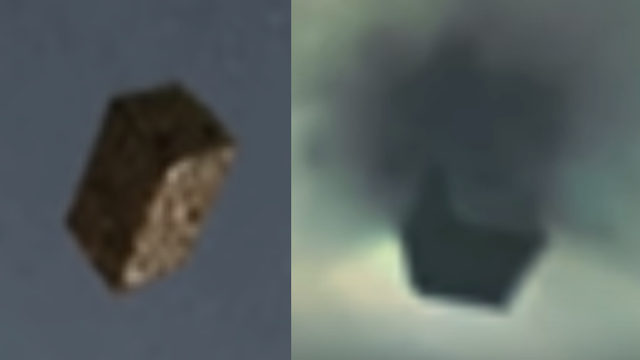 The research that Secureteam10 did with the image is done by bringing out the features of the craft hidden out of view by the clouds and low and behold they are there! That means this image or the images should I say, are very real. You can't fake putting graphics behind clouds inside images it just doesn't work like that. The full video shows you exactly what I mean and yeah I believe that this is good, I believe this is real and not a fake. It is a Cube UFO coming out of the clouds. 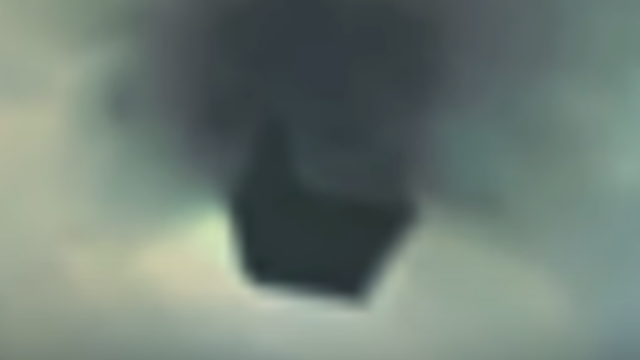 Like this image for instance where we can see the Cube UFO parts which are hidden by the clouds, only brought out by image tweaking like a professional would do. that's why I believe this is real. 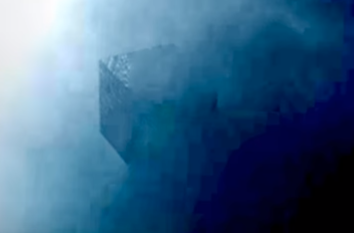 A bizarre and sinister-looking perfect black cube has terrified residents of a Texas town after it appeared in the skies above White Sands - the USA's most secret military installation. It looks like the Borg Cube Alien Spaceship from the TV show Star Trek. 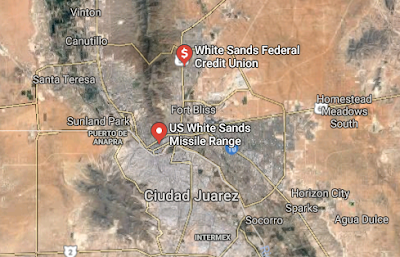 The terrifying black cube was snapped over El Paso on the Texas border just a few miles from White Sands - the infamous secret US military testing site which was where the world's first Atomic bomb was detonated. Almost all the experimental weapons research carried out at White Sands is highly classified, secret and very unusual as they're pushing the boundaries of what can be done and the pushing the envelope of science itself including physics. The results of the cutting edge research only become public decades later. The famous Roswell UFO site where aliens are reported to have crash-landed on earth is also just a few miles away from El Paso over the border into New Mexico. This is a famous UFO sighting and was picked up the popular YouTube channel Secureteam10. 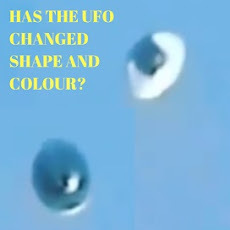 It's a very strange UFO encounter and has many people divided as to it's validity? Is it real or is it a clever hoax? Is it real or is it fake, these are the questions only you can come up with as nobody at the "authorities" as a whole is coming forward with any answers and as I've said before, NASA isn't going to tell us the answer we want to hear! They've made their position clear so we have to accept it. 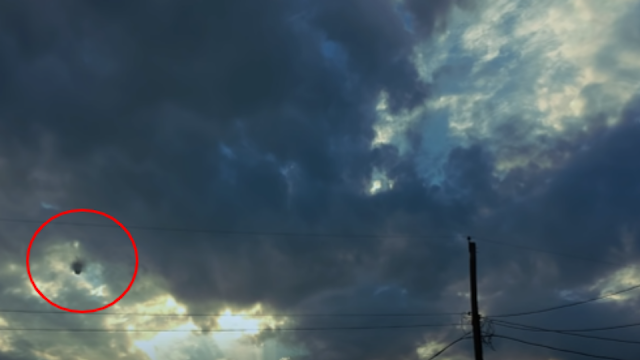 "It began to get very windy out and I noticed a small portion of clouds begin to swirl and circle in on each other forming a portal shape - at which point the portal became jet black." 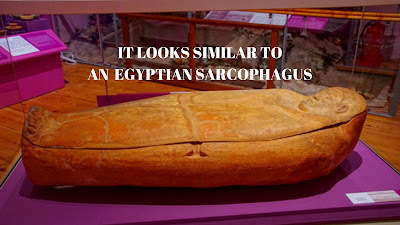 "I noticed a square-shaped figure. I was a giant solid thing with designs around it and a faint magnetic oscillation type humming." Walter passed his video on to phenomenon investigators Secureteam10. Source SOTT (Signs Of The Times). Source Image Reference Walter C. Lands. 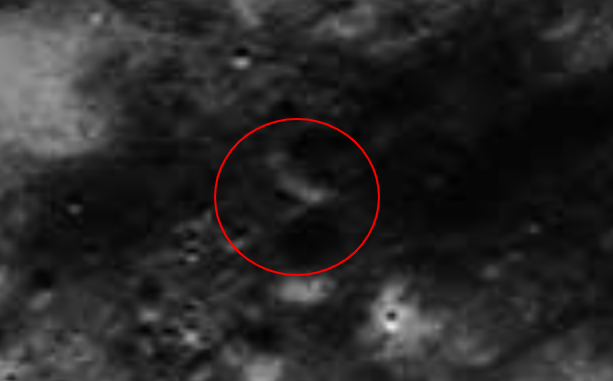 So I was looking at the alleged William Rutledge Alien Spaceship in the Deporte Crater on the Moon (widely reported on) and as I was searching the rest of that particular NASA Moon image #9630 in the middle but just to the right of it, I just happened upon this odd looking and very strangely "but familiar looking object". Do you think it looks like a SpaceX (lookalike) Rocket or a tower of some sort? 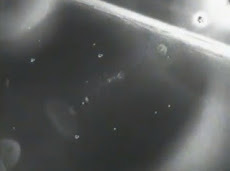 These images are from the Moon fly by's from the Apollo Moon Mission images. They are 100% real and all can be verified on the NASA website so these images are not fakes and they are not a hoax, they are real. I'm been serious, this is very, very odd looking and it shouldn't be there as far as I'm aware of because for one, it's got 3 legs possibly 4 legs as we can only see it from one side so I can't speculate if there is another leg on the other side as like I say, I can't see it? 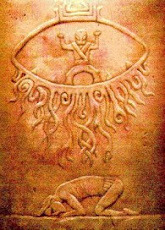 This has 3 legs and 2 half shadow circles at the very bottom of it - as we are seeing it from one side only. 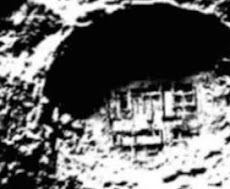 The flat Lunar surface has a shadow on it from this extraordinary Rocket looking (or tower) anomaly, don't forget how close it is to the Mona Lisa Alien Spaceship aswell. There's so many anomalies in just this one image. I'm not one hundred percent sure what it is, but I do think NASA has tried to blur this out or cover this up by blurring it away? If it is a rocket then this is an Alien one as we didn't use these types back when we went to the Moon and also it might even be a tower of some sort with leg struts? Then I also saw this other strange V shape entrance type unusual looking structure just sat there looking all intelligently made. Because that is not a natural formation and neither is the tower or rocket )I still haven't decided what I believe it is as yet)? But I will. 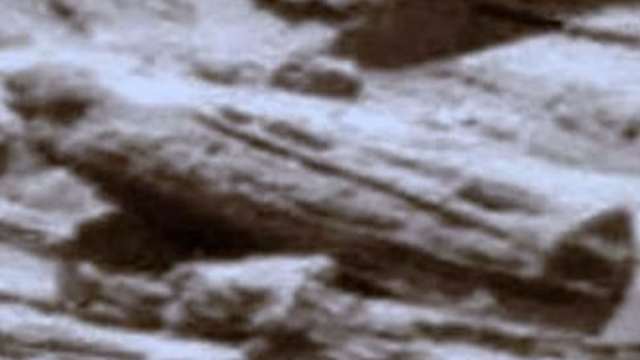 The Alien Spaceship anomaly and Alien nicknamed "Mona Lisa" in this image has been widely reported on - but for another strange anomaly to be found actually in the very same image is weird. Someone else might of found this also but I have literally discovered this as a one off chance so as they're all NASA images. 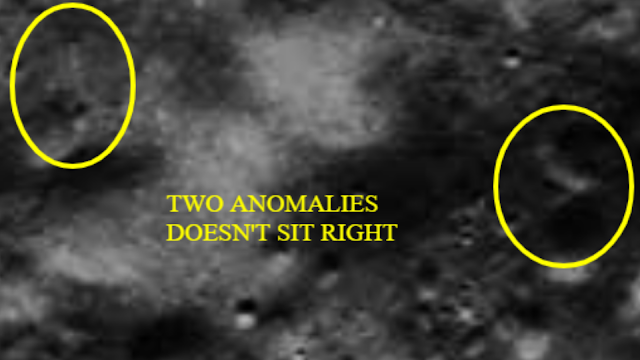 Well it's NASA who actually discovered the strange anomalies (but failed to mention them) first so it's NASA who has to get the credit, anyone else is just pointing stuff out, just like me I'm actually only pointing stuff out. I mean, it's NASA's image simple as, not mine or anyone else but we can report on the images as long as we give credit, so all image links and credit are at the bottom of this post and references also. 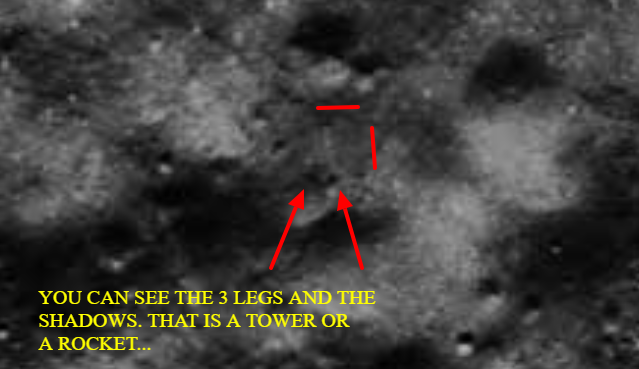 In this image below we can see the huge Alien spaceship to the left and the tower/rocket in the middle circled and the V shaped inner entrance to the Moon on the right. Obviously this is a zoomed out image so go and have a look at the above images to see the zoomed in look, cheers guys. Please share this post if you can, thanks. 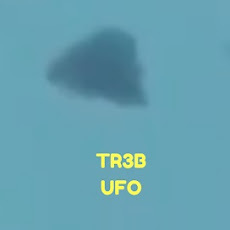 Source Reference UFO Sightings Daily. 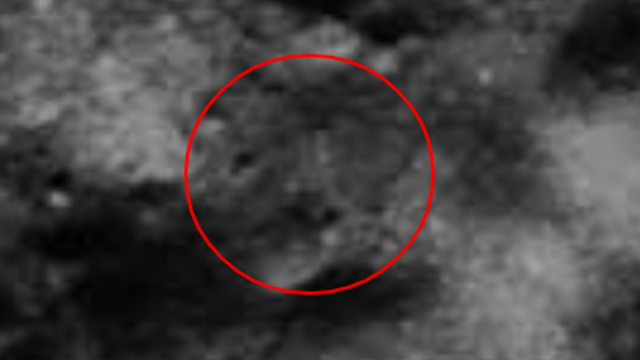 Source Reference NASA Image Number AS15-P-9630. 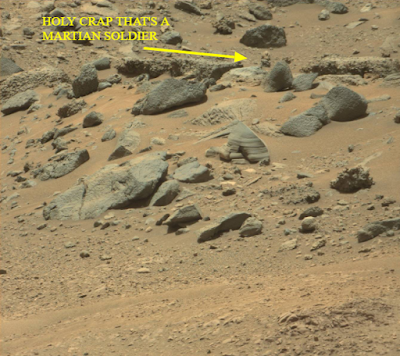 This is a real Martian soldier and this is a historic, poignant and mind blowing event and it's all been caught on the NASA Mars Rover's cameras for mankind's own records. Every now and again we are given a breadcrumb by NASA about the existence of Aliens living in space and I believe that this is one of them occasions? 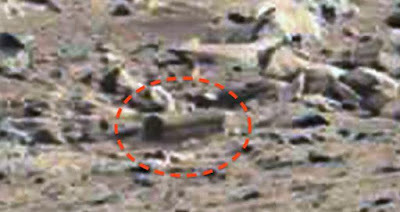 I believe that because what else can this be besides a real life, bone fide Alien either shadowing or stalking the Mars Rover? My gut feeling is that there is way more to this than meets the eye and in the future when Aliens are common place, people will start to ask the questions like was my UFO sighting real? Was my Alien abduction real or was it me dreaming it? I think in the future we will get answers and the answers will be very, very revealing. Again, we have not put this image through any filters or graphics software. 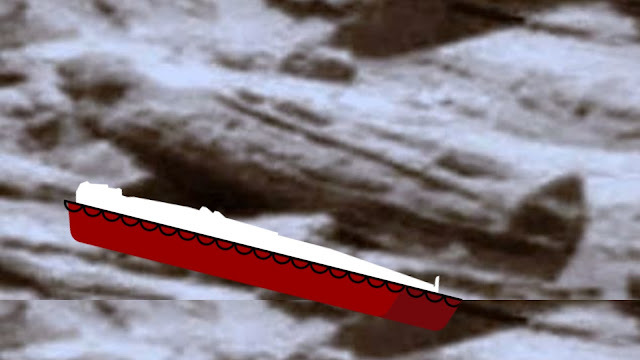 This is the same image as is on the NASA website - please compare it. 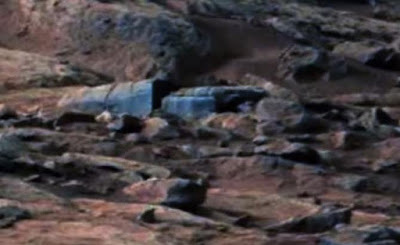 It is still obvious where the "Alien" is, even in this image and even though were zoomed out pretty far? This is why I am certain that this is an Alien that we are seeing. 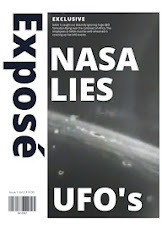 NASA cannot and will not - admit to Aliens been real or that the UFOs we keep on capturing on camera are real. 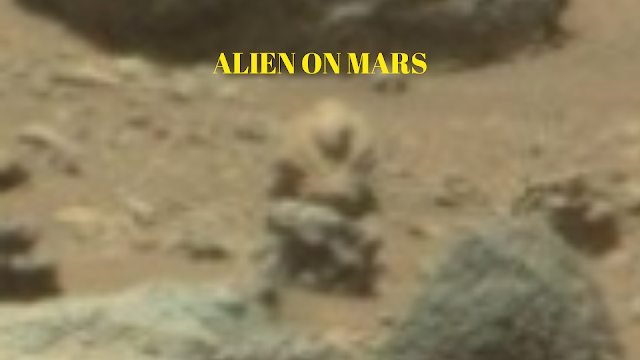 They will however put all the information that they want the public to know about online and I believe that this is their way of saying "Aliens don't exist but reading in between the lines, they do exist" by publishing this obvious image of an Alien on Mars? I could be wrong and this might very well be a rock or swamp gas, but I really don't think so, do you? I do not have any other answer for what this is or what the odds of the likelihood of this been a natural rock formation. I did this video to show how mind blown I am about this and just how much I really do believe that this is an Alien? 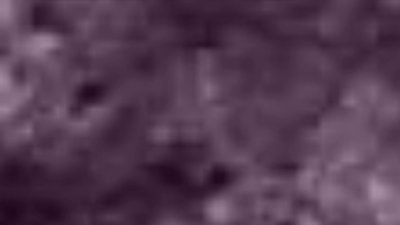 The video shows me telling you the thoughts I initially have and the thing that really convinced me this is an Alien and that's the Alien kneeling. I can see it's shoe, I can see it's suit and the scarf like neck material. The fact that this has a "gun" is absolutely scary aswell as it tells me that these Mars Aliens are armed, but why are they armed - what threat do they face? Is it us that are the threat? 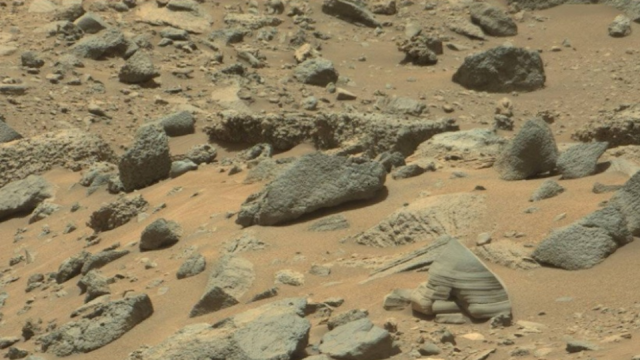 Is it human beings or is it another Alien race on Mars? We all must have many, many questions about this image guys. 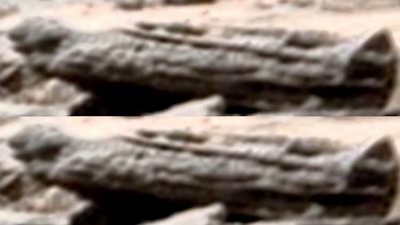 The the thing about NASA is they allow you to share their images and videos as long as you give them credit in the posts, so here'#s to you NASA for finally coming clean and showing us through your wonderful images that there are Aliens on Mars, cheers NASA JPL - Caltech and MSSS (Malin Space Science Systems). Guys, I've provided you with all the sources that I strongly suggest you should go and do some research on to find the interesting stuff? I've added the source of the raw image and the NASA co-workers websites that all work with NASA. 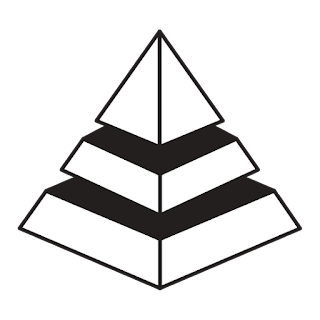 These sites are a wealth of information and valuable disclosure, depending on where you look and how you interpret the stuff your reading and seeing? 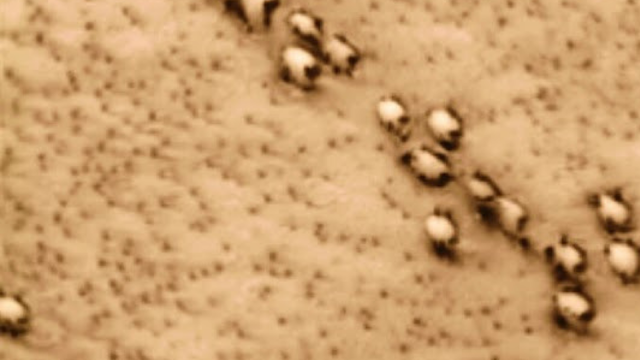 Also, here is a great post about a herd of animals seen on Mars again in NASA's own images. I decided to do this video and I think I explain myself and my opinions well? It's a quick video and I reckon that I get the message across, lol. Please share this post with your friends and lets get some dialogue going about what this actually is. 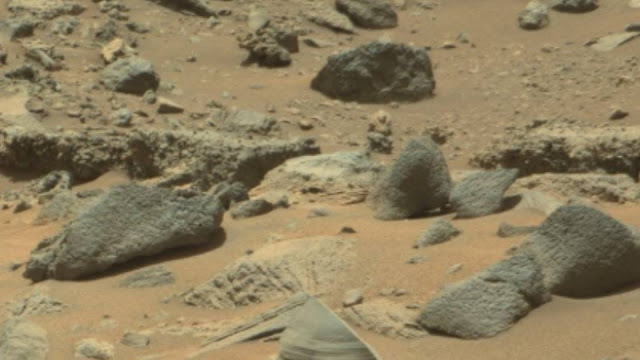 This image was taken by Mastcam: Right (MAST_RIGHT) on-board NASA's Mars rover Curiosity on Sol 1402 (2016-07-16 15:00:14 UTC). Source NASA/JPL - Caltech, MSSS. 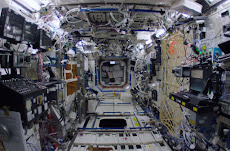 Source Reference MSSS Malin Space Science Systems. Source NASA Image Gallery Archives. Source Reference Caltech - JPL.